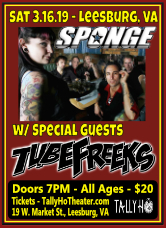 - Tubefreeks is psyched to be rockin' out with Sponge! - Direct Support for Sponge! - Look out Harrisburg, we're ready to ROCK!! - with Eternal Frequency, Another Day Dawns, American Evil, Heroes 4 Ransom!! - Get ready for the second edition of the Krusty Crab Jam!! - Last year's event was awesome so mark your calendars for this year's party! 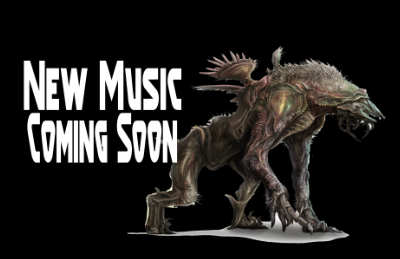 - More details including venue and band lineup coming soon! 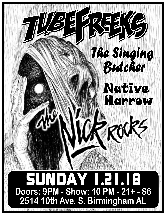 - More details to come as Tubefreeks has been awarded a spot on a national festival from our performance at the Rock Solid Pressure Industry Showcase! - with Saliva and MoJoRose! 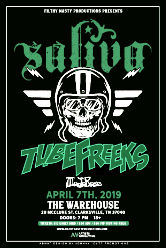 Don't miss this one as Tubefreeks is DIRECT SUPPORT for Saliva!! 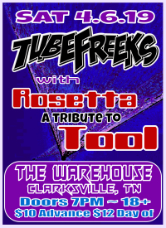 - with Rosetta - A tribute to Tool! 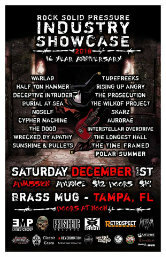 - Tubefreeks is psyched to be back at Tally Ho Theater with Sponge! 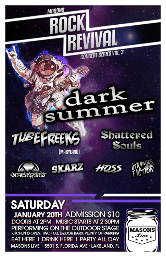 - Don't miss this awesome show at this awesome venue! 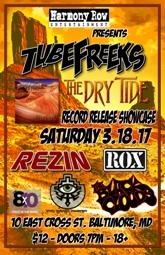 - Tubefreeks is totally pumped to get an invite to play the Rock Solid Pressure Industry Showcase! - Hosted by the Amazing J-Rock and Patty! Mesa Music Festival Kickoff Party! - Jamming with our pals The Mayan Factor! - 7:30 pm - Free Show!! - Join Tubefreeks for Lebabon, PA's new monthly open concert!! - With Stonewall Vessels, Mojo Bozo, and Invictum!! - 6-10PM in Downtown Lebabon - Tubefreeks plays at 7PM! 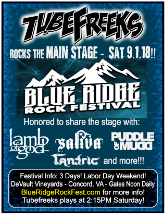 - Tubefreeks rocks the MAIN STAGE at Blue Ridge Rock Festival 2018!! 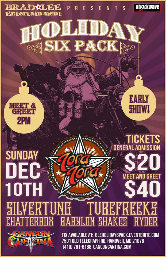 - Honored to share the stage with Lamb of God, Saliva, Puddle of Mudd, Tantric and more! 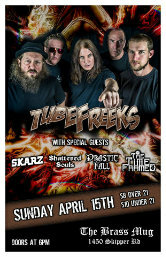 - Tubefreeks ROCKS the Baltimore Soundstage!! 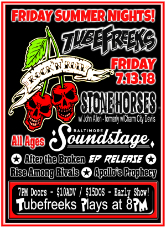 - Don't miss it as Tubefreeks rocks Baltimore's Premier Music Club!! With friends Stone Horses and more!! 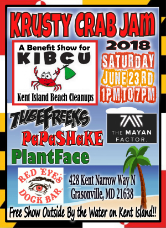 - It's the first annual Krusty Crab Jam on Kent Island, MD!! - This is a FREE outdoor show by the water on Kent Island! - 6 Bands!! - Tubefreeks, The Mayan Factor, Papashake, Plantface and more! 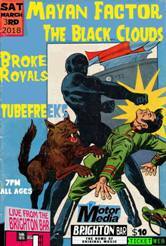 - Tubefreeks returns to the Tally Ho Theater in Leesburg! 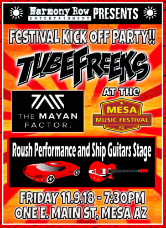 - Tubefreeks plays first so get there early! - Both shows are FREE! 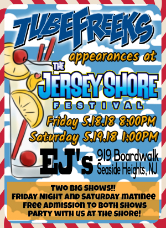 - Come party with us on the Shore! - Hosted by J-Rock and Patty from the Rock Solid Pressure show! - Look out! 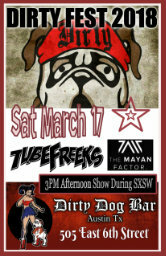 It's Tubefreeks at the Dirty Dog Fest at the Dirty Dog Bar in Austin! - This a FREE to the public showcase during the SXSW Festival and the house will be rockin. 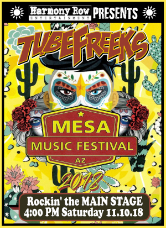 - Get ready Texas as Tubefreeks hits the The Heart of Texas Festival 2018. 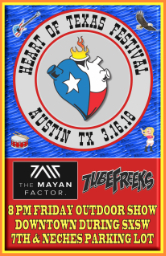 - FREE outdoor public show during the annual SXSW Festival! - The Brighton Bar has been bringing the Jersey shore, live, original music for over 34 years. - "Birmingham's Dirty Little Secret"
- $14, Doors at 7PM! 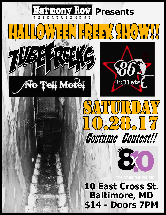 Don't miss this rockin' party Halloween style in Baltimore! 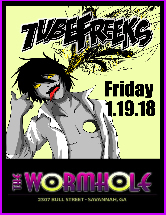 Tubefreeks jammin' with our good friends 86 Bullets and No Tell Motel, it's gonna rage! And wear your best costume for our Costume Contest!! Prizes for the top winners!! 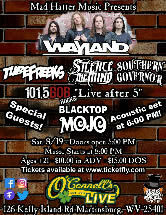 It's Biker Day in Martinsburg and Tubefreeks will rock with Wayland and others at this brand new outdoor venue. Come enjoy Wild Wonderful West Virginia not far from Hagerstown, MD!! 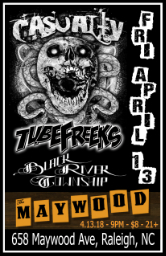 - Tubefreeks will be supporting national act Wayland! 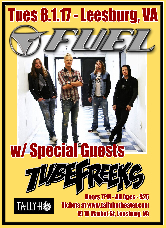 A Summertime Rock-N-Roll Party as Tubefreeks opens for rock legends Fuel! - All Ages so bring the kids! - Original Hard Rock finally comes to downtown Bethesda, MD! 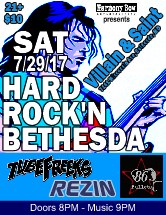 Don't miss these 3 great bands, Tubefreeks, Rezin, and 86 Bullets as they come back to destroy their old stomping grounds! 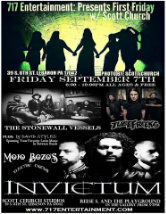 All 3 bands have members that have known each other for years, and this small club is gonna turn into one HUGE party!! Come rock out with us and have a great time!! 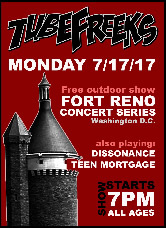 - The Fort Reno Summer Concert Series is an all volunteer Washington, DC institution which has presented free shows in the park for more than 40 years. The bills often feature a mixture of young bands just starting out alongside more seasoned bands -- all from the area's fertile independent music scene. 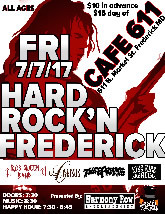 Original Hard Rock finally makes it to downtown Frederick! - Plus special guests Kiss Kiss Bang from Kentucky! 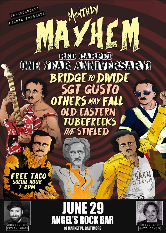 Don't miss this "See and be Seen" Red Carpet Affair as Monthly Mayhem celebrates it's One-Year Anniversary! 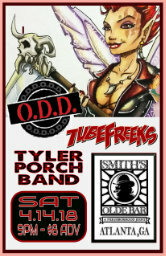 Join Tubefreeks and 5 other bands for a great night. The event is hosted by one of Baltimore's top promoters Kevin Hock of Transcendent Events and will be DJ'd by 98 Rock's Matt Davis! - Free Tacos Social Hour 7-8pm! - Validating Parking available at Pier Five, see a bartender. 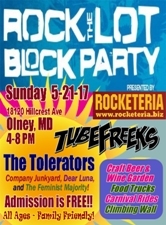 Join us as Tubefreeks headlines the annual Rock the Lot Block Party in Olney, MD. This raine or shine outdoor, festival style event is sure to rock! - Craft Beer and Wine Garden, Food Trucks, Carnival Rides and a Climbing Wall! - Guaranteed to be a great time! The Dry Tide CD Release Party!! Come celebrate the release of The Dry Tide with us! At the legendary 8x10 Club in Baltimore, MD - 10 E. Cross St.